This Scotch 4-3/8" x 6-3/8" Photo Size Self-Seal Laminating Pouches provides permanent document laminating without heat or hassle. No special tools or equipment needed. Clear to let important information show through. Scotch 4-3/8" x 6-3/8" Photo Size Self-Seal Laminating Pouches can be use for Signs, Certificates, Schedules, and more. Package Includes: Includes five laminating pouches. Used this to save my child's art from preschool and it does the job perfectly. I am so happy I purchased this and it was easy to use. Welcome to MyBinding Video. 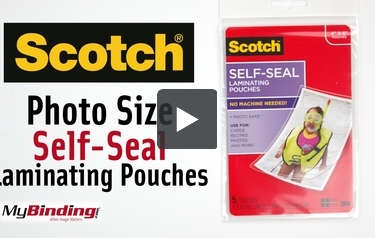 These are the Photo Size Self-Seal Laminating Pouches from Scotch. These pouches offer permanent protection for your photos or documents without needing a machine. They have rounded corners and are sized perfectly to give a 4x6 photo a 3/16” border all the way around. Just center your document inside the pouch against the clear side, remove the adhesive liner, and press firmly to seal it up. There are 5 pouches in this pack. For more videos and all your binding needs, visit MyBinding.com.